Fuerte Marbella in Marbella, Hotels in Marbella. 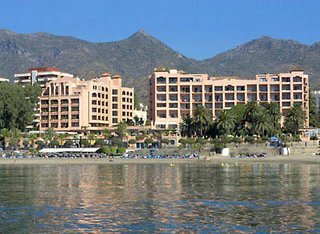 Hotels & Accommodation in Marbella. This hotel comprises a total of 226 rooms, of which 212 are doubles. Guests may take advantage of the hotel's reception, safe free of charge, currency exchange service, Internet corner and free WIFI Internet access and conference room. Additional facilities include shop, a TV room, a bar, a pub and an air-conditioned restaurant. 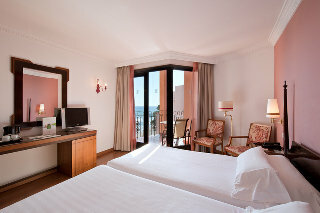 In addition, the hotel offers guests a room and laundry service, as well as a garage and car park for private parking. The beach restaurant is closed in January. A shuttle service from/ to Aeroport/ hotel is available at extra charge (aprox 65 min). 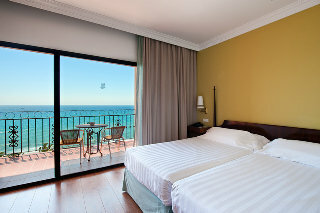 Guests have to consult directly with the hotel to make the booking- (+34) 952 92 00 00. Bathroom, Bath, Hairdryer, Direct dial telephone, TV, Internet access, Minibar, Fridge, Tea / Coffee, Central air-conditioned, Central heating, Safe. Air-conditioned in common areas, Reception area, 24h. Reception, Safe, Money Exchange, Lift-s, Cafe, Shop-s, Hairdresser, Bar-s, Conference room, TV room, Dining room, Restaurant -s, Restaurant - Air-conditioned, Restaurant - non-smoking area, Mobile phone network, Public Internet, WLAN access point, Room service, Laundry service, Launderette, Wheelchair accessible, Car park (Not included in price), Garage, Number of pools, Indoor pool, Outdoor pool, Fresh water pool, Heated pool, Sun loungers, Parasols, Sauna, Sunbathing Terrace, Massage (Not included in price), Special SPA packages (Not included in price), Gym. Bed and breakfast, Half board, Breakfast buffet, Dinner buffet, Special diets. Back to hotels in Marbella.